What you see in the image below is as far as I got, also you will see the "Prev" and "Next" buttons are greyed out. What is causing this and why is it that I cannot go any further? I tried to run Flight Gear but I got as far as what you see in the image below. As for the Dos Window, even though I got the No Disk Window the program kept on loading the necessary executables(?). 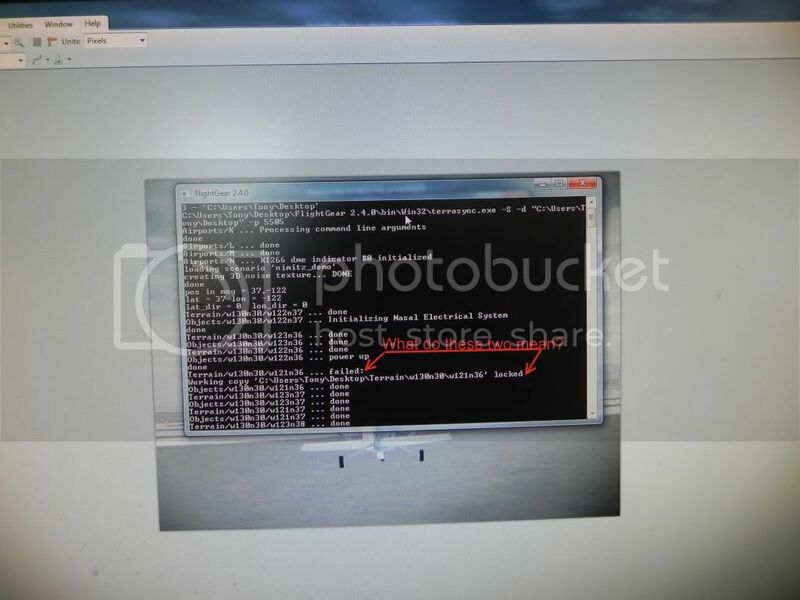 I was told the reason for the fgfs.exe - No Disk window is the osg80-osgDB.dll is probably corrupt. I got the latest osg80-osgDB.dll and copied over the corrupted one and still I get the "No Disk" window. 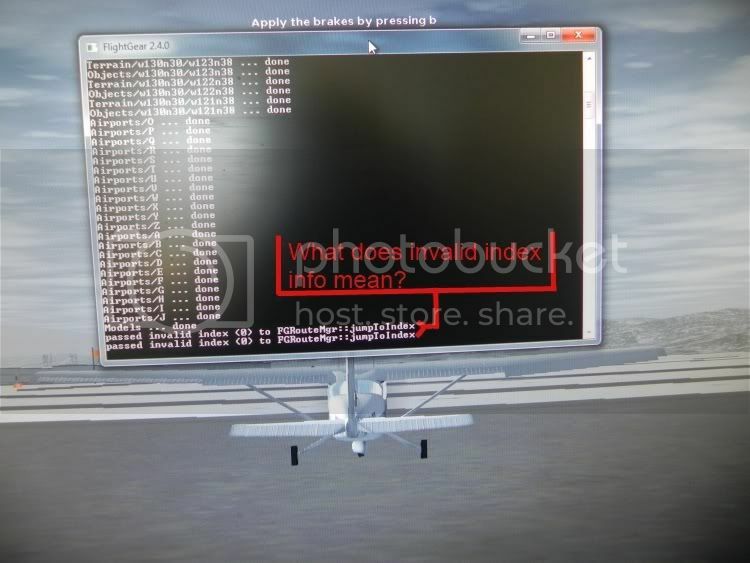 Is this a flightgear version 2.4.0 bug or is it a windows bug? I have been having this problem ever since I first downloaded and installed flightgear 2.4.0 from flightgear.org website around December 7, 2011. I even purchased a cd from Curt Olson and installed it but I still have the problem. I posed this problem to the forum but I have not gotten any help from the forum. I even posted it to the mailing list and XChat IRC but no help from either organization. I would like, if possible, to have someone who is connected to the developement team to help me out on this. Looks like you need to tell it where the Aircraft folder is. See the big white box with nothing in it? That's probably the problem. Point it to the aircraft folder which will be .../data/Aircraft. 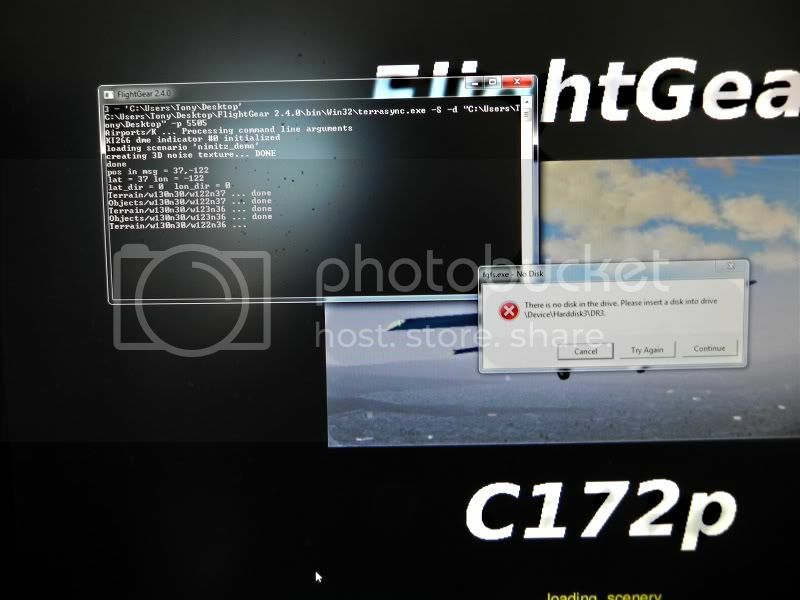 I have looked at your other topics (Cannot get Flight Gear to Run and OpenGL error) to see if I can get any more clues from those, which I couldn't. But thank you anyway for your detailed reports! I seems to me like you need more help than I alone can give, but I can at least try. That's really odd. I can't see any obvious errors in the paths, i.e. the location of fgfs.exe goes to the executable and the directories to directories. I guess you have allready double checked that the paths go to the correct directories using the browse buttons. Sealbhach wrote in Mon Dec 26, 2011 11:44 pm: Looks like you need to tell it where the Aircraft folder is. See the big white box with nothing in it? That's probably the problem. Point it to the aircraft folder which will be .../data/Aircraft. It seems you have seen at least a few of the posts in the topic Windows No Disk error, but I recommend reading through all of it if you haven't done that yet, as some have attributed the "No Disk" error to bad USB device management in Windows and have found other work arounds. It is quite puzzling that only some people seem to have this problem, while most don't. Tony D wrote in Mon Dec 26, 2011 10:40 pm: I even purchased a cd from Curt Olson and installed it but I still have the problem. I posed this problem to the forum but I have not gotten any help from the forum. I even posted it to the mailing list and XChat IRC but no help from either organization. I would like, if possible, to have someone who is connected to the developement team to help me out on this. I sure hope that more help will come so you can get started in FlightGear, and I can see that you have been troubled by this since at least a whole month. Hang in there, don't give up. 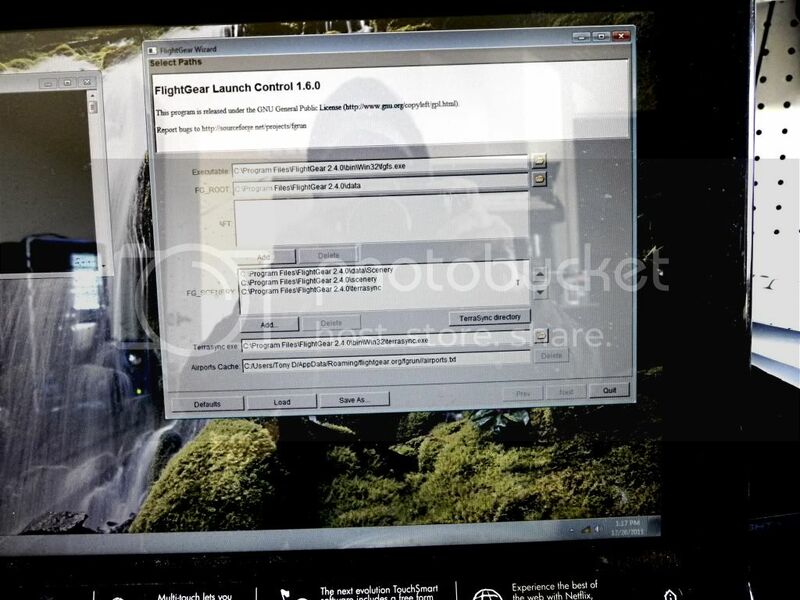 Well, finally got FlightGear 2.4.0 to run but I hit a snag as you see in both photos. It seems that I originally uploaded the same photo twice. Now, I have it right this time. Can anyone answer the questions I have in both photos? Last edited by Tony D on Wed Dec 28, 2011 5:52 pm, edited 1 time in total. For future reference, could you tell us how you got it working? Could be helpful next time. The messages about locked working copies (directories?) can be safely ignored. The the stuff gets in fact downloaded there anyway. Also I usually have TerraSync turned off while flying, as my computer is quite a bit slow and lags pretty much when TerraSync starts. EDIT: Oh, of course: Congratulations! as for the "prev" and "next" buttons being greyed out, run the flightgear wizard (place where you pick your aircraft and airport, etc) as administrator. i had this problem with my computer too. if the console says something like "unable to open SCSI controller, error code 0x...." then I am 95% sure you have to run as an admin. windows 7 does this so only the admin is allowed to access the host controller, so if someone that is non-admin tries to access it, the host controller returns an error code. I had the same exact problem.